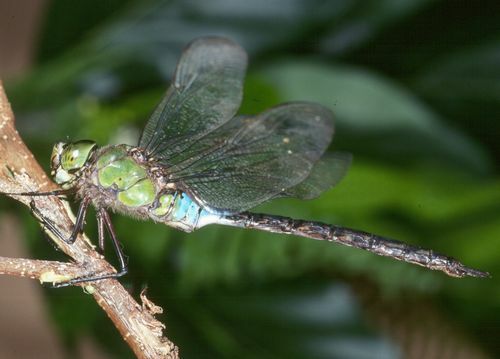 Habitat: This dragonfly is found along stream and wetland areas. Preferred Area of Stream: The larvae prefer slow-velocity pools and runs, but only in high elevation areas lacking native and introduced fish. Adults will patrol stream and wetland areas and even can sometimes be found close to sea level. Fact: The pinao is amazingly the largest dragonfly in the United States , and its wingspan is in fact larger than that of the giant darner (Anax walshinghami) found in the southwestern U.S. This beautiful dragonfly is distinguished from its lowland cousin the Common Green Darner (Anax junius) by its much larger size and the lack of a bright yellow markings on the front portion of its forewings.